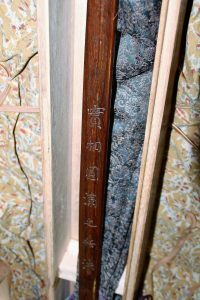 The Jisso Enman no Bokuto which belonged to Miyamoto Musashi sensei. 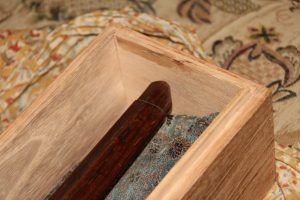 It is a national treasure and artifact which is now safely stored at the Usa Jingu in Oita, Kyushu, Japan. 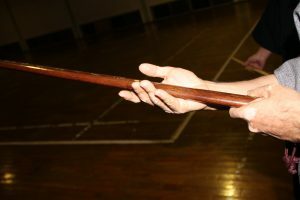 The Jisso Enman no Bokuto is passed down in succession through Musashi’s school – Hyoho Niten Ichi-ryu 兵法二天一流, today now under the guidance of Kajiya Takanori Kougen, 12th Soke. Disclaimer: when translating from old Japanese to modern Japanese to English, meanings can be lost or have multiple meanings to consider. Please keep this in mind. 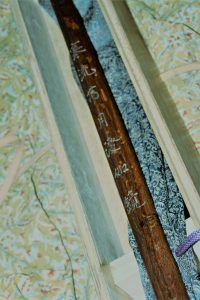 On the Omote it is inscribed 実相円満之兵法 (Jissou enman no Hyoho) which is related to the last words of Musashi sensei’s saying 天仰実相円満之兵法逝去不絶. (Ten o aoguni Jisso enman no Hyoho seikyo shite taezu) ‘Look up to the sky. Even if I die, my truly perfect Hyoho will never die’. kagamino gotoshi). – ‘In the flow of the cold and clear river. The moon is reflected. It seems to be a mirror. This talks about what one should have in their heart/mind/spirit when fighting. To have a normal, calm state of mind 平常心 (Heijoshin). So when in the fight, having that feeling of the moon: beautiful clarity, all the time.